The Dalai Lama publicly declared his withdrawal from politics a few weeks ago. While many have a hard time accepting a political future without him, I find myself standing diametrically opposed at the other end of the spectrum: I believe His Holiness’ withdrawal doesn’t go far enough to achieve the desired impact of modernising the Tibetan polity and making it survivable beyond his lifetime. When I learned about Kundun’s decision to retire, I was very happy for him. If anyone deserves a break, it’s the Dalai Lama. He has been working tirelessly and in all conscience for others since he was a child. While teenagers elsewhere are not entrusted to run even a household, the 16-year old Dalai Lama had to run a country threatened by hostile forces. He did more than his fair share, we all agree, and for the rest of us it’s high time to wake up, we all agree too. So could this be it? 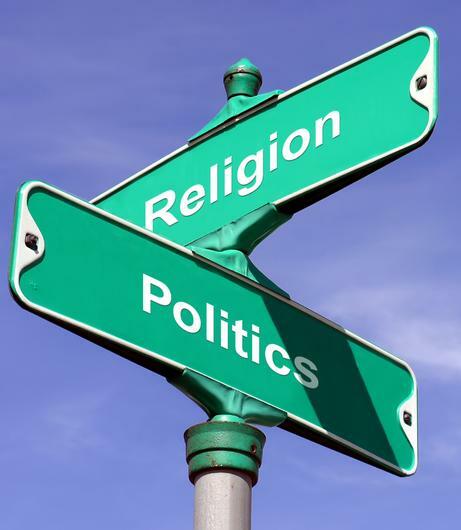 Could this mark the long-desired separation of religion and politics with the return of Tibetan Buddhism to the root of the Buddha’s teaching, and the beginning of modern government in the exile polity? Could his announcement to retire from politics really, finally mark the long-overdue mortal blow to the old Tibetan system of merging the spiritual and the secular by no less a figure than the central person in the system, the Dalai Lama himself? Pardon, but Kundun sometimes is not the best communicator. As much as I welcome his decision to withdraw from politics, I must say the form he chose for the address was awkward. We see the Dalai Lama sitting on a high throne while the others are congregating at his feet. In my eyes, this seating arrangement shows how Kundun himself is a prisoner of the system: Has he become so used to merging his two roles that he doesn’t realise anymore that this type of hierarchical seating arrangement is okay for a Buddhist teaching but not for a political briefing? There is nothing authentic in one person talking down from a throne to a group of people sitting cross-legged on the floor about “it’s time you introduce modern government”. Then there was the way he delivered the message: Frequent use of expressions such as hagoba chi-a (“note once and for all”) and the general non-use of honourifics made the tone of his speech patronising. 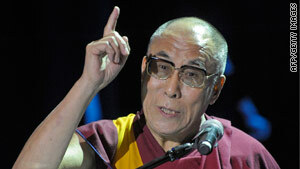 It created the impression that the Dalai Lama displays a lack of respect for his counterpart. The impression was reaffirmed by the Dalai Lama’s body language which showed him talking with a wagging finger. Sadly, I didn’t see a modern political leader withdrawing from a post. I saw a typical traditional person speaking down to grown people like a duck takes to water. But as much as it bothered me, nobody in the audience said anything although uneasiness transpired through the video to the viewer. Either it was all Mountain Phoenix’ wrong perception and there really was nothing wrong with the speech or the audience was in deed not happy, yet kept quiet, which doesn’t speak for mature, democratic behaviour. Ideally at this point, His Holiness, sensing the unease, should have invited feedback to allow for a conversation but that didn’t happen. So the end of the video shows uncomfortable silence on both sides with Kundun fiddling about with a few loose leaves from a Buddhist text. - Again: What business do scriptures have at a political briefing? In my eyes, the very event meant to clarify his earlier announcement to withdraw from politics was dripping wet with mchos-srid-zung-drel. It reconfirmed the impression that although our bodies arrived in the 21st century, our minds have never really left the old system. The most unsettling part in all of this, however, was what His Holiness did not address: He made no mention of all the other elected and/or appointed monks, apart from himself, who are still occupying posts in the administration and the parliament. If the Dalai Lama is serious about releasing the Tibetans to modern government, it is not enough for him alone to withdraw; it is indispensable to address the general withdrawal of the Sangha from politics altogether. 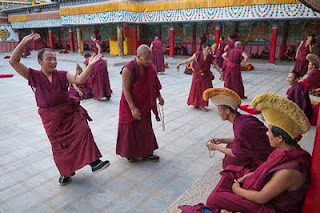 Removing himself alone won’t make the Tibetan polity secular as long as other people in robes further down the ladder continue to engage in politics. The Dalai Lama’s sole withdrawal would be an individual HR change at the very top with the basic nature of the exile polity remaining the same. In the worst case, another monk may be elected or appointed to high office in the future and the inauspicious cycle of Tibetan worldly dependence on Lamas is free to continue. But alas, to my greatest discomfort, there was no word on this most important of all points! And to further confuse the viewer, His Holiness dropped a remark in the video about: “We never called the Tibetan government-in-exile “the Tibetan government in exile”; we always called it “the central Tibetan administration”. - How do you even say that in Tibetan? He uses English in the video! Does anyone have an idea what he was getting at? I thought we and Dharamsala understand it to be the legitimate continuation of the Tibetan government toppled by the Chinese? And now it’s scaled down to “administering” the Tibetans living abroad? In my eyes, the “clarification statement” raises a lot more questions than it answers. But it looks like after the initial shock, many have already arranged themselves with the new situation and are now circling the whole discussion around technicalities such as amending the constitution, rather than showing interest in discussing a fundamental, structural course correction – or they are banking all their hopes on the newly elected prime minister without having to change anything about themselves. When something becomes a norm in a society, like religious rule for the Tibetans, it isn't easy to propound change because by questioning the specific practice, automatically all the people who are used to it, feel challenged. For the Tibetans the political role of the Dalai Lama and the general presence of the Sangha in politics are not only very normal but highly desirable. As wrong as it is, many of us have reached the acute point where they become really nervous at the thought of being politically governed by anybody else but a Lama. Have we truly lost all confidence in our own ability? 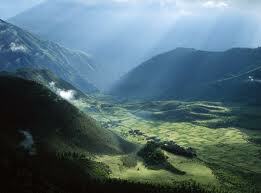 The only job a Lama has ever had is to guide inclined individuals on the path that leads to enlightenment. The job profile of a Lama does not include solving political problems, that’s mundane stuff and the people’s turf. The cool thing about Buddhism, which we claim we are the son and heir, is its egalitarian nature: Everyone has equal potential to Buddhahood. There is no external savior. Even the Buddha himself couldn’t save anybody because nobody is above the law of cause and effect - you reap what you sow. Straight and simple. The Buddha then showed people the path to enlightenment, but to actually walk the path is something everyone has to do themselves. It’s a dedicated personal effort. You not only have to do all the work yourself, but it’s only you who can do it. Doesn’t herein lie the beauty of the entire exercise called Buddhism? Have we forgotten? Have we perhaps also forgotten that at the final stage of Guru devotion, the Lama dissolves into us, and we become the Lama? Our mind and the teacher’s become one. So there is not only no external saviour on the worldly level, there is no saviour on the spiritual level either. Only you can save yourself! So when even in theory a Lama such as the Buddha himself can’t save anyone, how did we end up believing so firmly it could work in practice? Our idea of the Dalai Lama being capable of solving all problems on our behalf is so wrong altogether. It’s a Tibetan cultural creation superimposed on Buddhism and masquerading as such. Maybe we have also forgotten that even from a purely religious standpoint, Lamas have never held the absolute position we tend to award the current Dalai Lama. Do we not take pride in the non-hierarchical nature of Buddhism because in our religion, people are encouraged to develop a critical mind and are free to debate with their teachers since Buddha Shakyamuni’s time? Not out of ill intention, but out of a deeply felt, genuine desire to understand and evolve? Have all (former) monks in Tibetan society perhaps forgotten too? During a debate in the courtyard, don’t you have to present intellectually valid arguments based on the Peja to back your position? You wouldn’t just shout: “My Lama said so and he is smarter than you, so eat it!” You’d turn yourself into a laughing stock of the whole monastery if you did. So if we disapprove of this in a professional religious debate, then how come it’s okay to use it in worldly matters? Why is it socially acceptable to silence critical voices by merely stating the Dalai Lama is Chenresig and therefore knows better? I believe we are hugely confused. We cannot keep concepts apart since we are so used to blending the spiritual and the mundane. While on an ultimate or religious level, the Dalai Lama is Avalokitesvara, on a relative or worldly level, he is human – like the rest of us including the Buddha himself. But a lot of Tibetans don’t seem to recognise any longer that there are different ways of looking at things. They subconsciously blend the relative and the ultimate, the worldly and the spiritual, so that the person who is the Dalai Lama becomes the absolute authority on anything and everything. And to really let the corks pup they then understand this abstruse mixture to constitute “Tibetan Buddhism”. Say that centuries of this type of muddle-headed thinking did not turn us into a people who placed itself under disability. Can we not remember anymore that there was also a Tibet long before the emergence of the Dalai Lamas where our ancestors governed themselves? And have our minds become so narrow that we are unable to imagine a future where we will govern ourselves again free from religious influence? Some expressed fear that the Dalai Lama’s withdrawal from politics could mean abandonment. I wonder how this conclusion is possible at all. How could Avalokitesvara “abandon” anybody? The decision to resign as the head of government can only be looked at as the kind, gracious and farsighted step of a Bodhisattva who acts with nothing at his heart but the best interest of others. The Dalai Lama’s withdrawal from politics then cannot mean abandonment whatsoever, but really must mean the pure opposite: empowerment. Following our logic, his withdrawal can only be an expression of a Bodhisattva’s altruistic wish for us to begin our long outstanding emancipation. This is the only way to look at it. Any other conclusion is completely illogical. “Father, I am no longer the son of one family, one clan, or even one country. My family is now all beings, my home is the Earth, and my position is that of a monk who depends on the generosity of others. I have chosen this path, not the path of politics. I believe I can best serve all beings in this way”. We are fond of our country being called the abode of Buddhism. But more than 400 years ago in Tibet, we went the exact opposite way of the Buddha. We couldn’t resist and lifted a priest to the highest political office by making him ruler of the country. Some defensive voices might interject: “We didn’t invent it! Some Mongols forced it upon us!” But does it speak for us that we’ve kept it all this time, long after the last Mongol disappeared from the Tibetan scene? We hung on to it way into the 21st century - after 1959 even without a physical state. As a Tibetan, it feels terrible. I feel very bad for His Holiness who has always tried to do his best. But it’s no good denying what is plain to see: The path our ancestors chose was corrupted from the start. This is the harsh truth I believe we must learn to face. The 14th Dalai Lama, playing the central role in this ill-fated system, has worked to correct the system as far as possible. But as the clarification video on phayul.com shows, he is like a courageous patient determined to operate on himself: It doesn’t work well. This is why we absolutely must take advantage of the favourable situation the Dalai Lama is trying to create and press ahead with the complete separation of the spiritual and the secular. Today could be the day where the Tibetans in the free world choose to discontinue on the wrong path. It could be today that we begin to correct past mistakes for good. As Buddhists we know there is nothing predetermined or eternally valid. We all are Tibet and it is completely in our hands to decide which way we want to go and what kind of people we want to be. 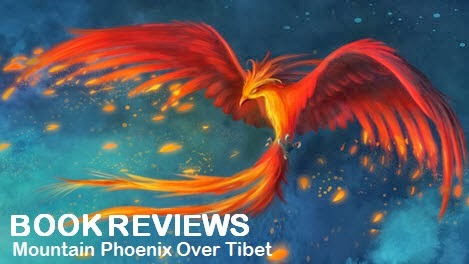 For some, including Mountain Phoenix, there is no question that we must pick up where we left off 400 years ago and reassume full control over worldly matters again. But we can only get there as a community, all of us together, and with many coming whole-heartedly to this conclusion. Let us start the painful political discourse today and not deceive ourselves by believing the job is done now that we elected a new prime minister; or now that some officials have held meetings, redistributed tasks and amended the constitution to reflect the Dalai Lama’s absence - and then we continue about our old ways. What we badly need, more than anything, is a change in mindset. I believe we need to relearn to relie on our own judgement for all matters regarding the worldly level. As Buddhists, we also know there are tools and techniques which can produce a change in mindset. What keeps us from applying them?